Thank you for considering a donation to the Grid Earth Project. Your donation provides solar powered lighting to those without access to electricity so that children can read, families can be more secure, and tragic health and economic issues associated with the use of kerosene can be avoided. It is only with support like yours that we are able to help these people improve their lives. The Grid Earth Project is a 501(c)(3) nonprofit organization. Your contribution is tax-deductible to the extent allowed by law. Your donation is processed through PayPal to ensure security. This is an image from NASA; the earth at night. See how much of the planet has no light? This is why we exist. LIFE... Light Is For Everyone. 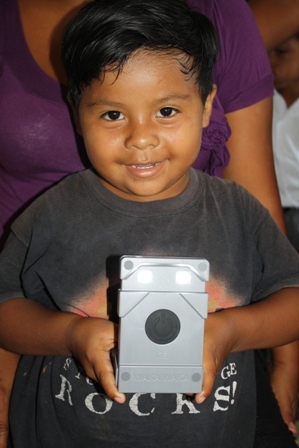 Donate $40 USD to provide a family with a solar powered light for their home. Click here to enter your own donation amount. Every dollar helps Grid Earth give LIFE.